Hello! Today, I want to introduce you guys to iDress. iDress, an online fashion retailer, specializes in discount wedding dresses NZ, flower girl dresses, bridesmaid dresses, affordable ball dresses and cocktail dresses. They have an incredible selection of affordable, stylish dresses for any special occasion. If you're in need of a dress for a formal event, iDress has you covered! 1. Blush Boat Neck Cap Sleeve Floral Chiffon Long Prom Dress $175. I'm loving the neutral color and intricate detailing on this dress. It's so glamorous, so luxe. 2. Vintage Red Strapless Sweetheart Long Evening Dress with Tulle Overlay $147. How lovely is the deep red color and tulle skirt overlay of this dress? Very romantic. 3. Lace and Chiffon Sleeveless Boat Neck Long Formal Evening Dress with Slit $139. The neutral color of this dress and thigh-high slit of this dress make it an ideal bridesmaid dress. 4. Vintage Modest Sleeveless Emerald V Neck Pleated Short Prom Dress $118. Swooning over this rich color! Additionally, I'm loving the flattering, fitted silhouette. ***Disclaimer: iDress provided monetary compensation for this post but I wrote the actual post and all opinions written in this post are mine. Hello! Today, I wanted to introduce you guys to Gudeer. Gudeer, a discount bridesmaids dresses shop, specializes in wedding dresses, bridesmaid dresses, prom dresses, special occasion dresses, luxury dresses and jewelry. They have a wonderful variety of formal dresses to chose from. No matter what special occasion you're searching for a dress for, Gudeer has the perfect inexpensive dress for you! 1. Unique Shoulder Wrapped V Neck Long Tulle Bridesmaid Dress $159. The soft blue color and flattering bodice of this dress are irresistible. 2. Purple Illusion V Neck Short Chiffon Bridesmaid Dress with Bow $129. Short and sweet- what's not to love? 3. Two Tone Wide Strap Pleated Long Chiffon V Neck Evening Dress $129. The color-blocked style and flowing silhouette make this the perfect pick for a bridesmaid dress. 4. Grape Short Sleeve V Neck Long Chiffon Bridesmaid Dress $179. The deep, rich color of this dress is absolutely perfect for this season. Besides loving the deep plum color, I can't stop obsessing over the flowing silhouette. 5. Simple Grey Strapless Sweetheart Long Pleated Chiffon Bridesmaid Dress $129. This classic dress may be simple but it makes a perfect bridesmaid dress. ***Disclaimer: Gudeer provided monetary compensation for this post but I wrote the actual post and all opinions written in this post are mine. Hello! It's now been over a month since I've used any sort of heat on my hair-yay! Read my original post on this subject HERE. While I definitely have my wild hair days, I'm loving leaving my hair natural. I feel like by quitting using heat on my hair, my hair is longer and it seems as if the naturally curly texture is enhanced. All that being said, since I no longer use heat on my hair, I have to be more creative with how to deal with my bad hair days. Yeah, I can just throw it in a braid but doing that too often feels boring and uninspired. When I was experiencing a bad hair day last week, I decided to switch things up and try something new. I threw my hair up into two little buns on top of my head which feel like alien space buns to me. And I love it. This style will definitely be a new go-to when I can't figure out what in the world to do with my hair. For my outfit, I slipped on a basic textured dress. 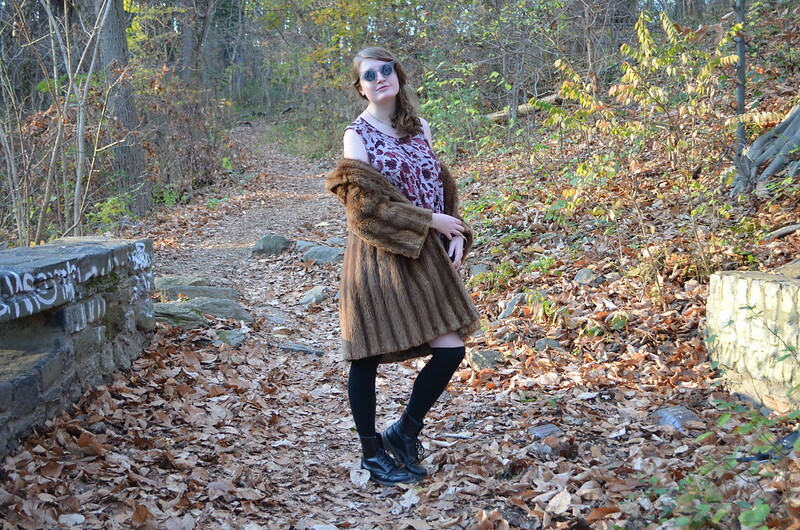 I made a statement by pairing the dress with a bold leopard print faux fur jacket and lace-up thigh high boots. I kept my accessories to a minimum, only donning a futuristic pair of sunglasses to play up the outer space vibe of my hair-do. Red lipstick pulled the whole look together. Hello! Free People has done it again. They've released a new lookbook that once again, I'm falling all over. The lookbook, the First Frost, features Queeny van der Zande, a Dutch model, at a cozy cabin in the woods. And this lookbook has me dreaming of winter break big time. Now if only I was spending my winter break at this cabin! The rustic-luxe vibe of the cabin established by the rich hardwood floors and brightly printed and embellished pillows and blankets is giving me major envy. Of course, I'm also drawn to the clothing and accessories showcased in the lookbook. I'm swooning over the luxe layering and unique knits in the collection. The long textured cardigans, the thick knit scarves and cozy thigh-highs socks in this collection all captured my heart. Hello! 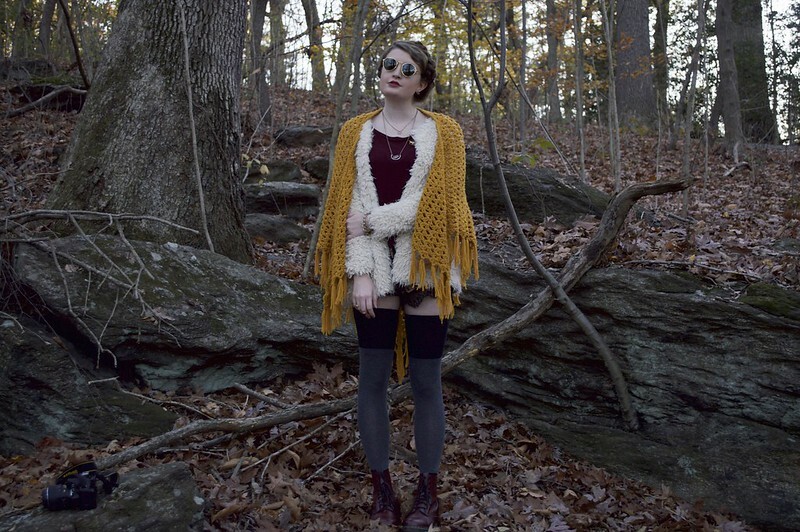 This past weekend, my friend, Rachel, and I set off to the Wissahickon trail to practice our photography skills. Next semester, both Rachel and I are interning for College Fashionista. 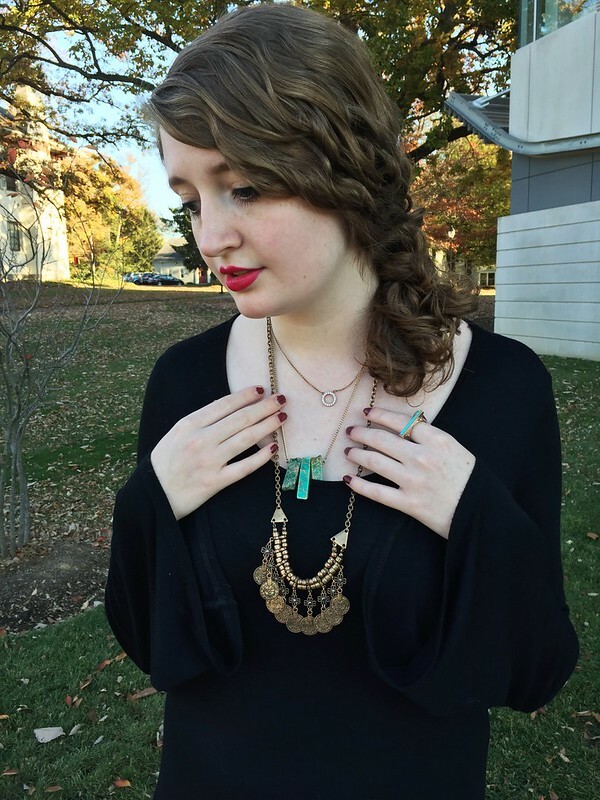 For those of you who haven't heard of College Fashionista, it's a fashion site where college style is highlighted. 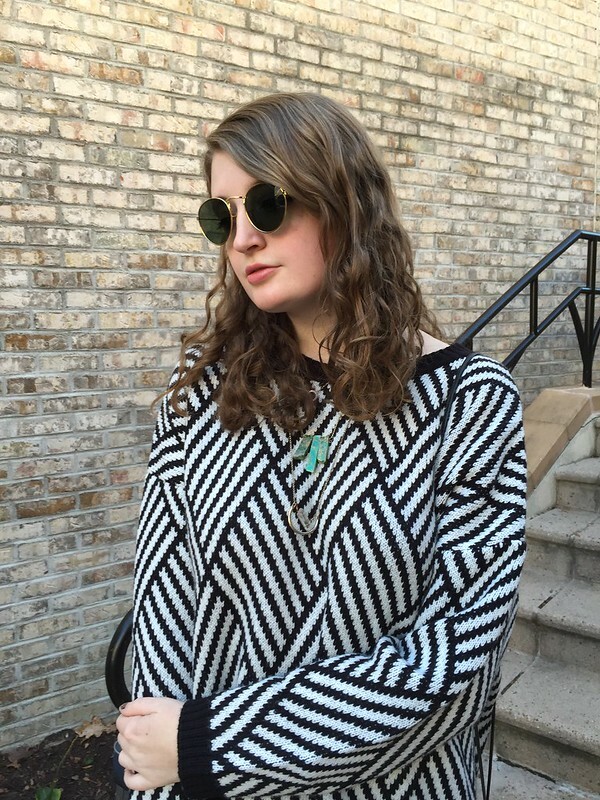 Rachel and I will be in charge of snapping street style photos of well-dressed students at PhilaU and writing articles about their looks for the site. I'd love to actually work for College Fashionista someday so I'm thrilled for my internship next semester. For our posts, Rachel and I are required to take photos with an actual camera- not just our phones, so we signed out a couple cameras from school for the weekend to figure out how to use them. We both enjoyed honing our photography skills and I love how the photos turned out. For the shoot, I put together a free-spirited, quirky look revolving around several of my favorite pieces of clothing in my wardrobe. 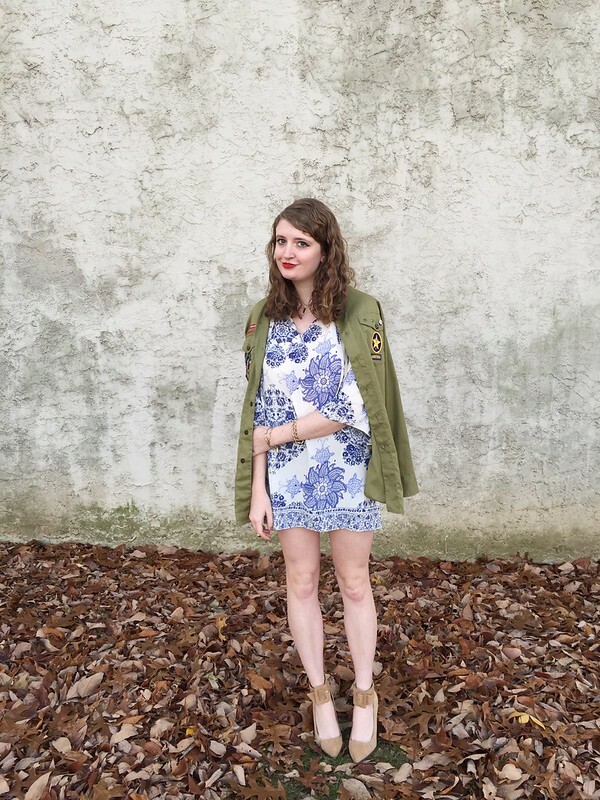 I styled the look around this pair of watercolor floral shorts. The ethereal print and lace trim of these shorts draws me back to them again and again- even when it's chilly enough outside to throw on a faux fur jacket! I highlighted the warm colors in the shorts with a burgundy, lace trimmed shirt. I played around with texture by layering a cream-colored faux fur jacket and mustard yellow knit shawl on over the look. I can't get over how much I love the lace-faux fur-knit texture combination. It emits a very rich, luxe mood. Of course it would have been too cold to wear the shorts on their own so I styled them with a pair of colorblocked thigh high socks. As a side note, I'm currently obsessing over these thigh high socks; unlike plenty of other thigh high socks I've tried out before, they go up pretty far on my thigh and have a charming two-tone design. I ordered them from GoJane a few weeks ago for about $6 which is a pretty good deal for a pair of thigh high socks like these! When GoJane offered free shipping last week, I ordered two more pairs of thigh high socks in this style but in different colors. When you find a pair of thigh high socks, you've got to stick with them! If you're like me and you wear thigh-high socks fairly often, you know how difficult the struggle to find the perfect thigh-high socks can be. 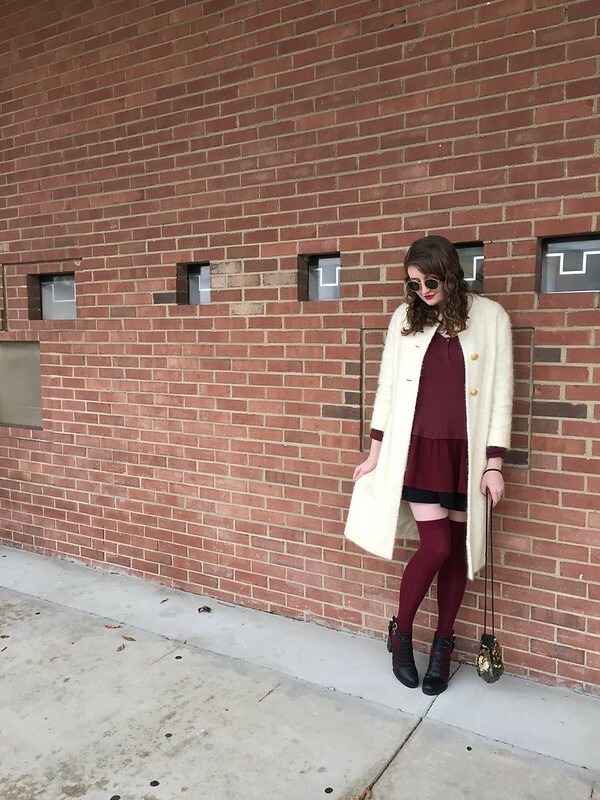 I paired the thigh-high socks with a pair of burgundy Doc Martens. Yes, I own shoes other than heels! I accessorized with a few golden rings, bracelets and necklaces. I accentuated the golden color of my jewelry with a pair of gold-rimmed sunglasses. A swipe of lipstick and a fairytale braided hairstyle pulled the look together. 1. Fantastic Lapel With Zips Patchwork Jacket $25. I love the soft color and versatility of this jacket. Perfect for throwing on with so many different outfits. 2. Concise Assorted Leather Crew Neck Blended Bodycon-Dress $17. A refreshingly modern twist on the little black dress. 3. Casual Loose Boat Neck Pullover $17. There's something so boho, free-spirit about this sweater that I can't help but love it; the interesting detailing and eclectic silhouette make this sweater a must-have this season. 4. Women's Hollow Out Plain Round Neck Pullover $16. I'm loving the unique green color, trendy silhouette and textural knit of this sweater. It would look great thrown on over a printed dress or styled with a pair of high-rise jeans and a pair of killer heeled booties. 5. Charming Boat Neck Cotton Striped Bodycon-Dress $14. Such a classic piece that would be a great addition to any wardrobe! If you're looking to add a couple new trendy pieces of clothing or accessories to your wardrobe, I would recommend making Fashion Mia your first stop. Their assortment of fashion-forward styles at affordable prices is unbeatable! Hello! A few days ago, I decided to take the opportunity to debut one of my most recent wardrobe acquisitions- this tan jacket. I love the faux suede texture, neutral color and cozy lining of the jacket. I purchased this jacket from Yerdle. For those of you who haven't heard of Yerdle, Yerdle is essentially a huge online yardsale. Yerdle users can sell their used items as well as buy items from other Yerdle users in the online Yerdle marketplace. This jacket was 50 Yerdle dollars but luckily I had that many Yerdle dollars in my account and just paid shipping! So I purchased this gem of a jacket for less than $10. I would definitely recommend checking out Yerdle and their unique online thrift shop/yardsale essence. And if you sign up with my invite HERE, you can a get a $35 Yerdle credit and free shipping on your first purchase. How could you say no to that? Join and update your wardrobe with a new-to-you piece of clothing or accessory with no cost to you today! For this minimalistic look, I styled the jacket with an asymmetrical black dress and black booties. 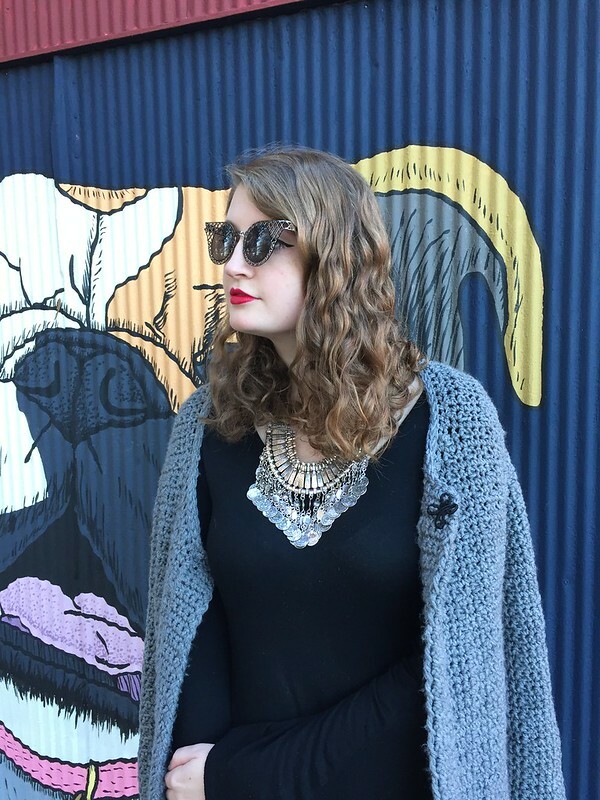 I added detail to the look with a pair of polka dot tights, delicate golden jewelry, golden sunglasses and a pop of red lipstick. Hello! When Express reached out to me and asked me to participate in their holiday challenge for bloggers, I couldn't resist. I mean hey, what blogger would really turn down Express? On a related note, I must be doing something right with my blog if I get PR emails from Express! For their challenge, they asked that I round up a few of my favorite holiday party looks from their shop to share with you guys. I've featured my fave pieces in the image above. While browsing through Express, I fell in love with all the different options they offer for holiday parties. They have the most incredible beaded and embellished dresses that I can't help but swoon over; the ornate glitzy detailing gives the dresses such a rich, luxe vibe. Perfect for holiday parties! I also adore their selection of glimmering earrings, stunning heels and richly detailed bags. After seeing everything they have to offer, you can bet that I'll be making a stop at Express to browse through their merchandise in-person. If you're shopping around searching for your perfect holiday look, I would recommend making a stop at Express also. And be sure to keep an eye on their Black Friday and Cyber Monday pages for their #EXPSWEEPS and a chance to win their New Year's Eve in NYC contest! Hello! As a (seemingly always) broke college student, I'm forever looking for ways to save money. My hectic class schedule has deterred me from getting a job this semester and therefore, my budget is very, very limited. Even $10 decisions have to be carefully thought out before going through with them. For that reason, I'm drawn to various sites that help save money by offering various coupons and discounts. And that's where Coupon Code Day comes in; I just discovered this site and you can bet that I added it to my bookmarks. Coupon Code Day highlights current sales, offers discounts at your favorite shops and even has free shipping offers. Coupon Code Day promotes the idea that they "believe that you can have your cake and eat it too – even if you’re doing it on a budget" and aim "to arm consumers with the latest, functioning coupon codes in order to make their money stretch further." Coupon Code Day offers all those deals to all of their users' favorite stores (really though- they have discounts for over 1,900 retailers!) Another reason I like them is because their website is easy to use and navigate through. They have a search bar at the top of their site where you can search for coupons from whatever retailer. Coupons from 6pm? Check! Discounts from Kohl's? Check! You can also browse their site by store or by category- perfect if you're shopping around for a good deal on a certain product. Additionally, they have an option where users can upload other coupon codes and discounts that they have found so that users can share their savings with other users. You can definitely count me as a new Coupon Code Day user! Coupon Code Day should always be the stop you make right before an online purchase. If there's a chance you could save money just by searching to see if Coupon Code Day has a deal for you, how could you pass that up? ***Disclaimer: Coupon Code Day provided monetary compensation for this post but I wrote the actual post and all opinions written in this post are mine. Hello! Ever since I added this mustard yellow shawl to my wardrobe last week, it's practically all that I want to wear. 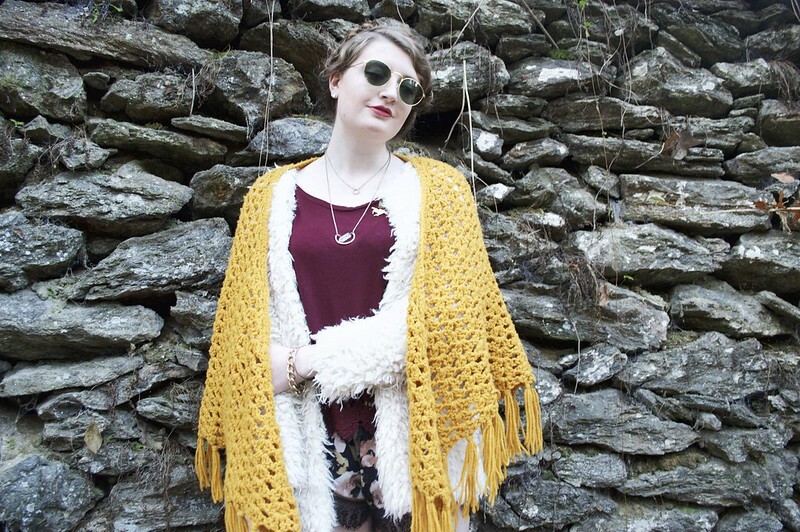 The bold mustard yellow color, knit texture and seventies appeal of the shawl all make it absolutely irresistible. I find myself reaching for it again and again to layer over whatever outfit I'm wearing and having to restrain myself from wearing it too many times in a row. After all, I do have a reputation on campus for dressing well that I do have to uphold and I don't think wearing the same piece of clothing day in and day out fits in so well with that. I figure I can wear it a couple times a week and get away with it. 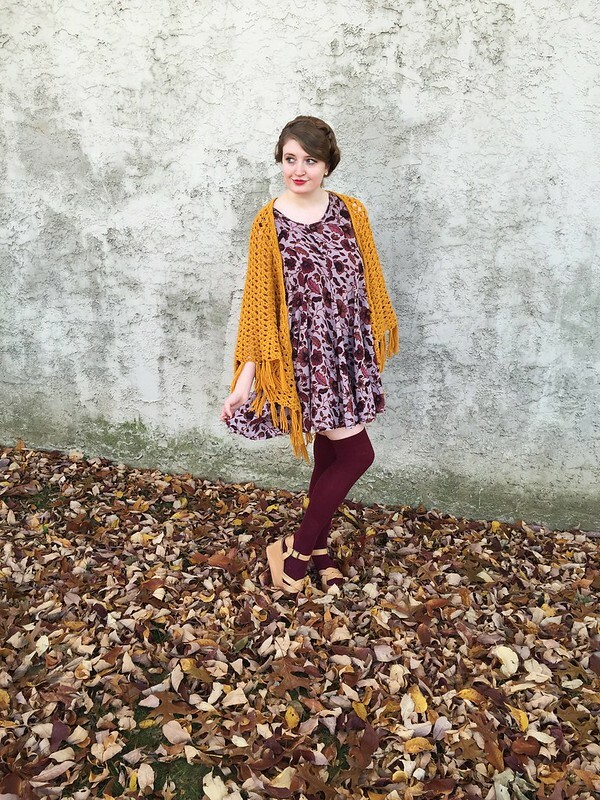 For this look, I threw the iconic seventies shawl over a cute daisy printed dress. 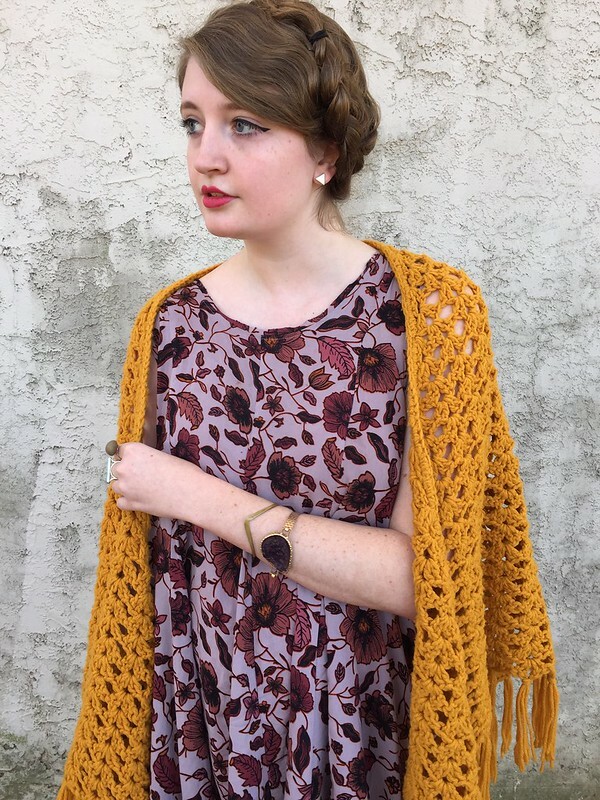 Although it's barely noticeable in this photo, I like how the color of the shawl accentuates the tiny bit of yellow in the daisy print of the dress. To emphasize the free-spirited, bohemian appeal of the shawl even further, I also styled it with a pair of seventies-inspired neutral wedges. I accessorized with a handful of golden bracelets and a couple golden necklaces. A swipe of red lipstick finalized the look. Hello! Scream Queens, a comedy-horror television show, premiered this fall and I can't stop obsessing over the fashion in the show. 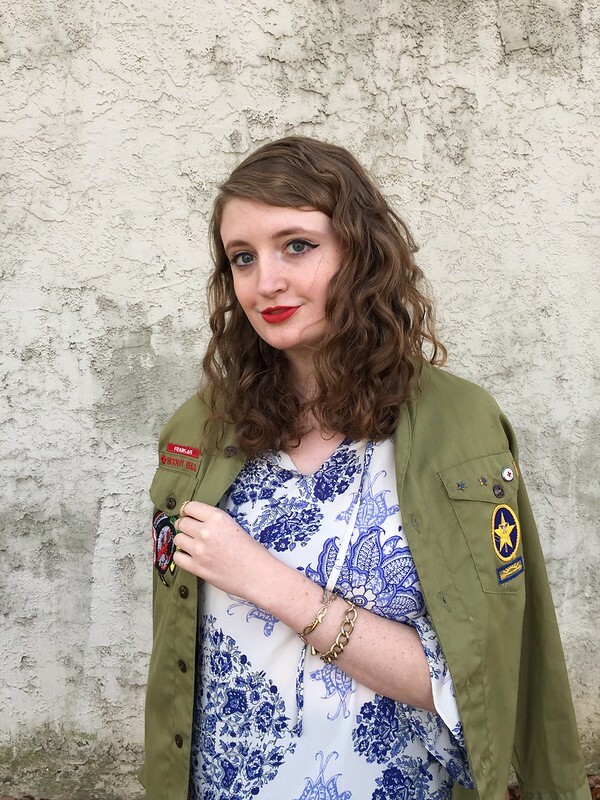 Talk about major style inspiration! The show features Emma Roberts, style icon, as Chanel, a sorority president surrounded by a well dressed clique (group of minions?) Chanel and her clique are consistently dressed to the nines in fluffy furs, boxy jackets, cropped cashmere sweaters and platform heels. All in various shades of pastel pinks, blues, lavenders and mints. All pastel everything. What would a scream queen be without her baby blue platforms and gigantic pastel pink fur coat? As if the fashion in Scream Queens isn't making me envious enough as it is, I'm swooning over Chanel's closet in the show. Her closet features a spiraling staircase and shelves and racks of the most incredible pieces of clothing and accessories; her closet in the show is bigger than the townhouse that I currently live in with four other people! Do you guys watch Scream Queens? What do you think about the style in the show? Hello! There's nothing I love more than the various shades of autumn. Rich burgundys, warm reds, burnt oranges, mustard yellows...the colors of the leaves falling all around me definitely have a major impact on my wardrobe. 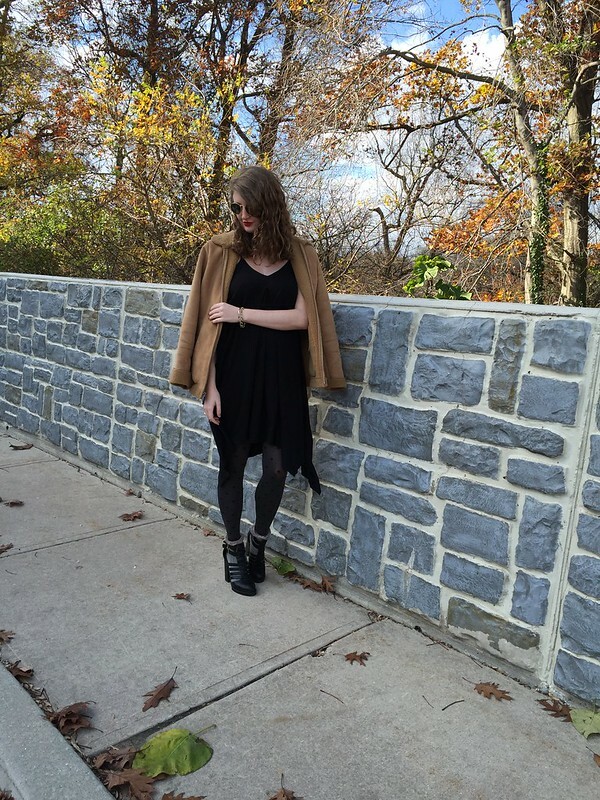 For this look, the color scheme of my look mimicked the falling leaves. I started the look with this maroon, paisley dress. The seventies inspired print and deep colors of the dress make this dress one of my repeated fall favorites. I've worn this dress much more than the other dresses in my wardrobe throughout the past couple years. 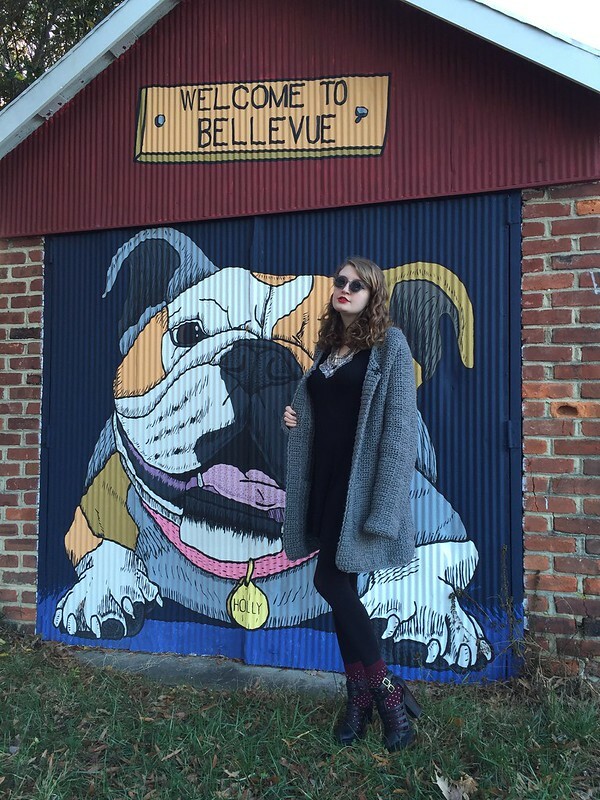 You can check out a few ways I wore it last fall here, here and here. I purchased this dress for around $20 from Forever 21 quite a while ago and while Forever 21 seems to get a bad rap for the quality of all their merchandise, this dress has held up wonderfully. I agree that Forever 21 may not produce the best quality merchandise all the time but I've definitely purchased a few items from them that have become wardrobe favorites and lasted for a while. 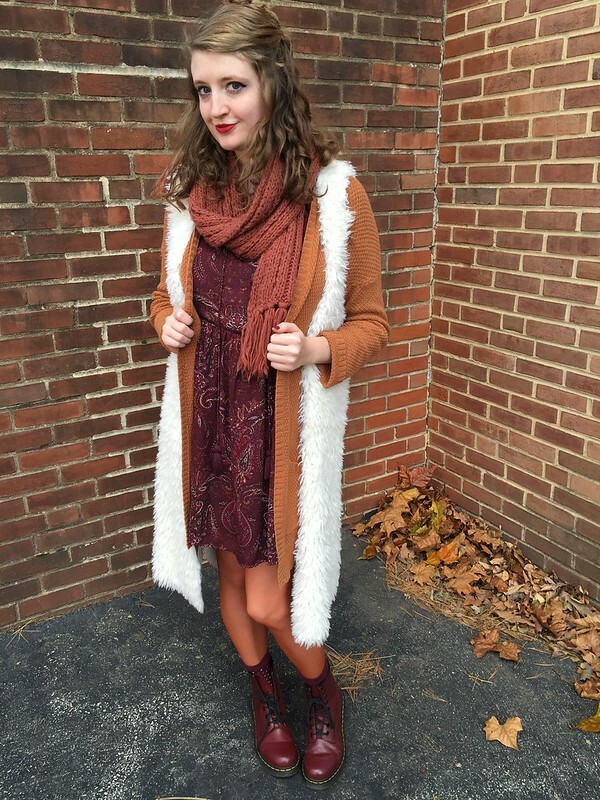 I wanted to play up the slight orange coloring in the pattern of the dress so I slipped on a pair of burnt orange tights, a cozy orange scarf and my favorite autumn cardigan. 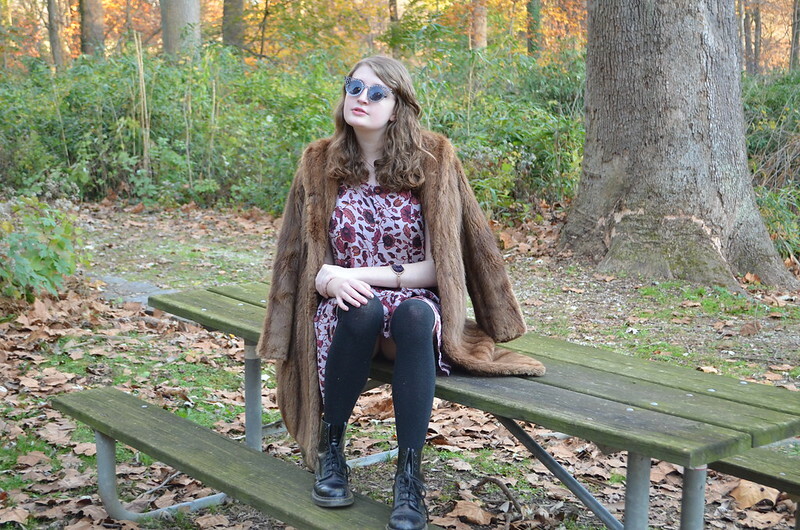 I layered a white faux fur vest over the look. I'm all about textural looks so I love the combination of the different textures from the subtle knit of the sweater to the faux fur of the vest to the woven textile of the dress to the chunky knit of the scarf. The tights also add an interesting texture to the look. Maroon and white polka dot socks and burgundy Doc Martens pulled the rest of the colors in the look together.